Everyone agrees "Takin' it to the Streets" is one of popular music's most inspiring calls for unity, except maybe the Doobie Brothers' original lead singer, who took it as a sign that he should keep on rolling. 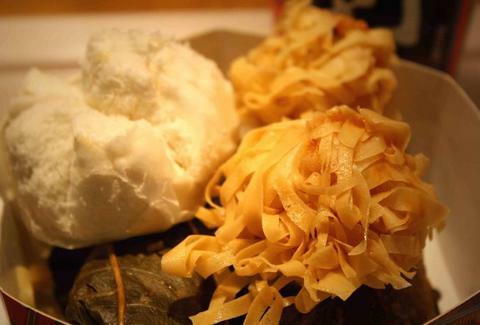 Uniting the hungry by taking dim sum to the streets: NOW, officially launching...now. From mini-food maestros Ping Pong, this concept eatery slings take-out "inspired by today's urban China" from a nook where Blade Runner-style neon walls face off against a more old-fashioned Chinese-tile floor and casual dine-in seating's provided by curved, temple-like wooden stools, hopefully not the result of someone eating way too much fibre. The sum's all hand made in the open kitchen, then served individually, or in baskets like the chive/chicken shu mai/chicken cashew Classic, the Seafood (mixed s'food, plus har gau & coriander), and the Vegetarian, with a spinach, a mushroom, and another stuffed with spicy & "golden" vegetables (Krugerplants?). A plethora of sides include classic pork buns, crispy prawn balls, seafood sticky rice, duck rolls, and hot & sour soup, plus yet-smaller goodness like pork crackling, seaweed prawn crackers, and white sesame & ginger snaps, which is bound to happen when people refuse to see the human being underneath that terrifying demon hair. NOW's also serving beers like Tsing Tao and Sun Lik, plus innovative juices (wasabi virgin mary, melon & lime bubble tea, mango & mint cooler...) whose kooky recipes they'll be constantly tinkering with -- no matter what they come up with, it'll be a favorable alternative to Black Water.